Calvin Presbyterian, St. George and Trinity Lutheran unite to provide a monthly meal for the community of Long Lake and their church members. These community meals aim to bring people of all ages, backgrounds and abilities together for a meal. All people are welcome! This is a great way to meet people from your community. Dinner and beverages are provided; there is no cost for the meal but donations will be accepted if you wish to give. The location varies from month to month as the churches rotate hosting duties. Please join St. George’s Latino Community in celebrating Cinco de Mayo Day with fabulous authentic food, music, and entertainment, including a performance by Alma Folklorica! The Church of St. George and the Juettner family invite you and your family to a Mass of Thanksgiving for the 40th Anniversary of Ordination to Holy Orders of Fr. Mark Juettner, a priest of the Archdiocese of St. Paul and Minneapolis. Fr. 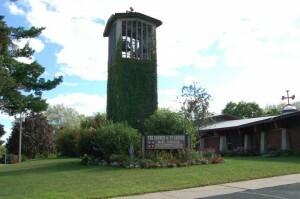 Juettner was ordained a priest at the Cathedral of St. Paul on June 2, 1979 and offered his First Mass at the Church of St. Alphonsus, in Brooklyn Center, on June 3, 1979. Reception/refreshments follow each Mass in the parish community center. When responding on Evite, in the column: ‘add a comment’ – please indicate what Mass time(s) you are selecting to attend and the total number attending from your family so that we can plan for the correct number of people. Also, you may forward the Evite invitation to others, whose email addresses may not be known or current. No printed invitations have been sent by mail. Thank you for your assistance in communicating this event to any other individuals whom you think may want to be notified about this anniversary celebration here at the Church of St. George. We also welcome you to call the parish office to RSVP if you do not have an email address. The Father William Nolan Council #12293 has been offering continuing education scholarships to the students at St. George for seven years. Founded by brothers Ray Hoffman, Greg Ehalt and Bill Pollard, the scholarship program started off with a $500 annual offering and has grown to over $2,000 today. The Knights are committed to helping as many of our youth as we can, as they are the future of our parish and beyond. Once again this year, the council is excited to announce scholarships will be offered to St. George high school seniors, current college and vocational technical students, as well as graduates choosing to serve our country. The scholarship program is just one of many ways that our council serves our communities and parish. We have been fortunate enough to have fundraisers help make this scholarship fund a reality and to grow with each passing year. Without the generosity of the parish, this would not be possible. Anyone interested in making a donation to our scholarship fund, please contact Grand Knight , Ed Rundle. Thank you all for your kindness and support of our council. Those interested in applying for this scholarship should look for the scholarship display which is located in the church entrance or download. Read through the application and eligibility requirements, fill out the application, and then submit it to the address listed on the attached form. There is not a set number of scholarship awards to be given out – it is based upon the applicant pool and funds available in a given year. EMERGENCY LINE TO FATHER JUETTNER: To report an after-hours medical emergency or death, please call 952-473-1247 x150. At the Church of St. George, we respond to God’s call by building a Christ-centered community through education, liturgy and prayer. In caring for one another we live the gospel, seeking to meet the needs of our parish, our immediate community, and the world. Through Mass and the Sacraments, our community service outreach, our religious education programs, and many other activities we grow and share in faith. Please join us – all are welcome! Some exceptions may occur with notice provided. For an appointment, please call Fr. Juettner at 952.473.1247 ext 104. Mass is in the chapel. Rosary at 8:10am. 9 + 9 = ? Prove you are not a robot! Add the two numbers and put the answer in the box below.